Hi dear blog …..it’s been almost a year again since my last post so I guess it’s time for another update. I will strive to maintain you a bit more than I have done. For some time now I’ve lacked the inclination to maintain blogging but that is no fault of yours. At any rate, it’s good to have my favorite recipes compiled together and I hope they will be useful for other people. The recipe below is for Steamed Cakes and is one of my mother’s. Like most of the other recipes here, steamed cakes is also a form of comfort food for me. As the seasons are changing and we enter cold, drizzly Autumn, my craving for comfort food has returned. My life is also going through its own seasons and some recent experiences have left me feeling confused, shocked and with my nerves worse for wear. There have also been some changes at work which have added to my feelings of tiredness. I work for a charity organisation that supports people with disability. It is for me something I love. I’ve been doing volunteer work since I was in high school and have always wanted to work in the community sector. A job that allows me to do this which also focuses on promoting social inclusion and diversity is something I always dreamed of. However the sector is also changing with the introduction of a new insurance system for people with disability. Pour into individual molds and steam for about 15 minutes or until a skewer inserted in the middle comes out clean.Serve warm with butter or a little bit of cheese. The recipe above is for basic steamed cakes to which you can add your favorite flavor extracts and coloring. In the picture above, I had made buko-pandan, yam and strawberry flavored steamed cakes. To make this, just divide your batter into 3 separate bowls and add your extracts and coloring respectively before pouring them into the individual molds and steaming. This entry was posted in Breads, Cakes, Desserts and tagged breads, cakes on April 7, 2016 by m.
Yes, this is a food blog…I am a self confessed, incurable, incorrigible, “foodie”. To a large degree this translates into a deep joy in relishing food from a physical perspective. Putting together a bunch of seemingly random ingredients, giving way to creativity and imagination to make a satisfying, good looking and delicious result. Howevever, more than from a physical sense, I find satisfaction and nourishment in food from a spiritual perspective. Since this is my own blog and I choose what to post in it (yay me! ), I thought today I would post a bit about one of my favourite soul foods…music! For me, music, particularly Christian music is a necessary part of my daily experience and feeds my spirit more than physical food sustains my body. One of my favourite radio stations to listen to is Hope 103.2. If you’re in Sydney then you just tune in to …..103.2 in your FM dial. Otherwise, you can listen online. It’s a great source of Christian and contemporary music. I also love listening to the Daily Devotionals with Pastor Chris Witts which you can subsribe to in iTunes (this totally works for me as my iPhone is usually where I am). I don’t have as much time these days to take photos of and document my cooking attempts, however this gives me more time to share some of my favourite spiritual food with you instead. Like this song “This I Believe” from The Creed. I heard this song from Hope 103.2 not too long ago and it has become a new favourite. I just found it on youtube to share with you as I don’t know how to it link to iTunes. I hope you enjoy this nourishing meal! This entry was posted in Home and tagged Daily Bread, Home on July 20, 2015 by m.
My mother and I were watching a show we both love not too long ago when we made a wonderful discovery. The show was ….dare I say it? Arguably uncool, totally nerdy but so what I love it Poirot. I like Agatha Christie’s novels and enjoy watching the Poirot and Miss Marple series. The Poirot series is set in the 1930’s and we were admiring the art deco items from the time. My mother noticed the tea set from the episode we were watching and said it looked a lot like the dishes they’d had when she was a child. They were milky green, a bit transclucent and lovely. Before we left the Philippines she looked all over for another set but could never find any. For the last 27 years since we moved to Australia she had looked for these dishes at homeware and department stores but still could not find them. So, when she mentioned it to me, I did a little bit of research the intuitive 2015 way……Google! Within minutes, we solved the mystery of the green dishes. My grandfather had worked as an aircraft mechanic in an American airbase prior to the Philippines’ independence from US colonization in 1946 and the subsequent establishment of our own national airport. 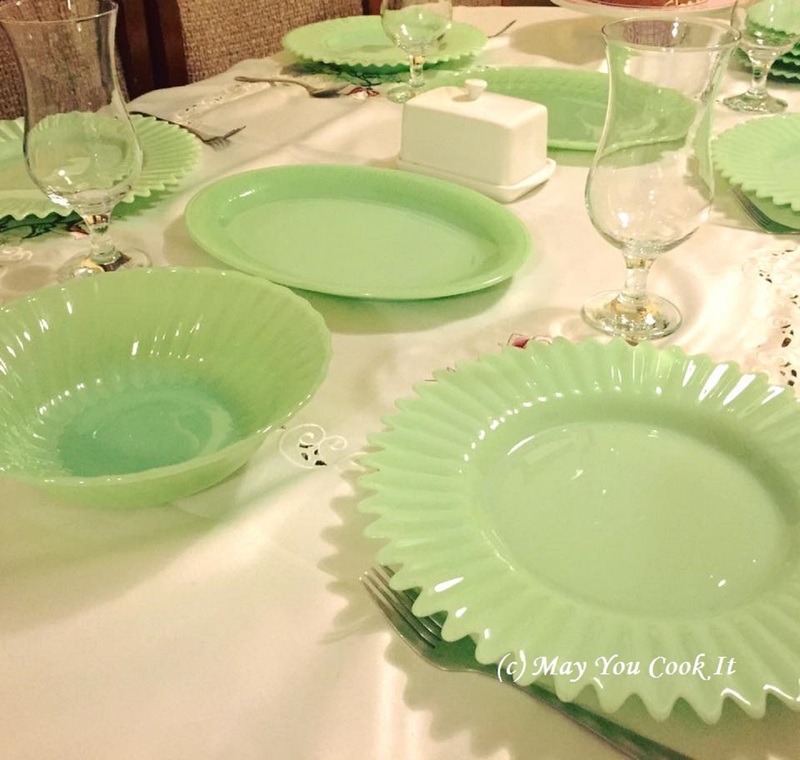 Consequently my grandfather sometimes bought American-made products including the jadeite plates . As the plates were not produced in either Philippines or Australia, my mother could not find them after we moved. However, they were mass produced in the US and were inexpensive during the 1930s- 1970’s. They were manufactured by McKee (the first to produce these), Jeanette Glass Company and Anchor Hocking. Mosser Glass produces more modern jadeite pieces. My search in sites like Ebay and Etsy led me to vintage jadeite plates while in Amazon.com I found a variety of new and old. They are collectable items these days and although they were reasonably priced, they turned out a little bit expensive in terms of postage and currency conversion. After we discovered the plates I have to admit I also fell in love with their beautiful mint green loveliness. I understand now why my mother loved them so much and it is nice to have a lovely part of history on our table. This entry was posted in Breakfast, Cakes, Desserts, Mains, Meat & Seafood, Muffins & Cookies, Savouries, Vegetables, Vegetables and sides on July 11, 2015 by m.
It’s Winter again and yes, I know it’s been over a year since my last post. For anyone who reads this blog, (yes, this means you!) sorry for the long delay. No, I didn’t drop off the edge of the earth (thankfully!) and I am still alive and breathing (thankfully!!). I’ve been a bit busy and I have to admit I haven’t felt inclined to write in a while. Dear old blog…maybe I didn’t update you “quite as often as I could have”… but you were …. *sometimes*… on my mind, hehe. Anyway…I didn’t forget you and here I am again. After a pretty warm and mild Autumn, Winter is starting to settle in and wrap Sydney around her cold, windy, drizzly blanket. And, as always, the chilly weather is making me crave warm, comfort food. 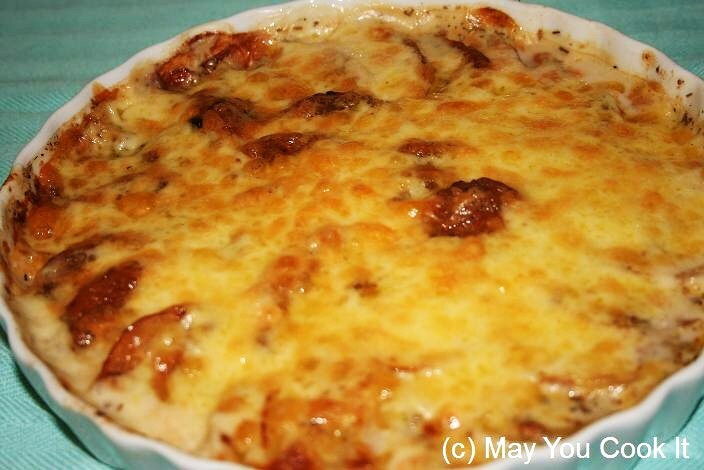 Potato Gratin is one of those comfort foods. It’s familiar (we go way back since Primary school days), tastes delicious and it’s consistent (no matter where you are or how old you are when you eat it, it will always taste about the same…which is comforting). About 1 cup reduced fat cream or skim milk, warmed. Preheat oven to about 180 degrees celsius. Halve the garlic clove and rub the sides and bottom of the baking dish with it before discarding the clove. 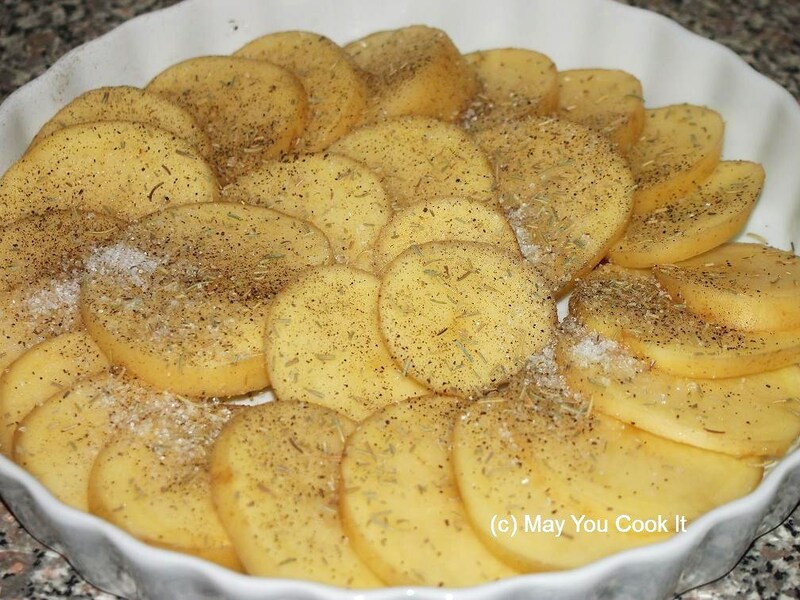 Layer the potatoes into the baking dish in an overlapping pattern. Sprinkle with rosemary, salt and pepper. Pour the warm cream or milk over the potatoes. Cover with foil and bake for about 35 mins or until the potatoes are tender. Remove the foil and sprinkle the cheese mixture over the potatoes. Bake for a further 10-15 mins until golden. That’s all there is to it. Very easy and so nice served warm out of the oven. It makes a delicious side dish and I usually serve it with steak and a bit of steamed vegetables. Definitely one of my favourite Winter warmers! 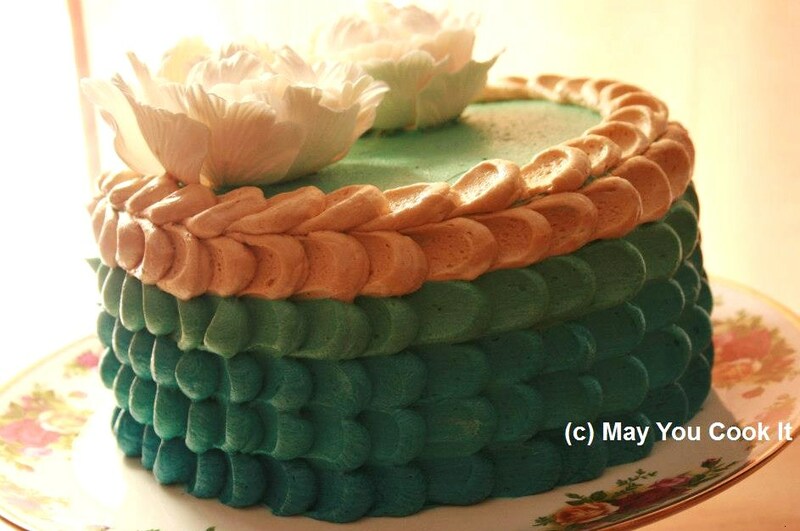 This entry was posted in Vegetables and sides on August 23, 2014 by m.
It was my brother’s birthday recently and his favorite cake is mocha chiffon. Like a dutiful little sister, I decided to make him a mocha chiffon cake for his birthday. The recipe is outlined below which is pretty straightforward to make and tastes delicious. 6 eggs at room temperature, separated. 1. Preheat the oven to 190 degrees celsius and grease two 9×2 inch baking pans. 2. Mix the yolks and sugar until light and creamy. Gradually add the oil then mix in the vanilla, chicory and coffee essence. 3. Sift the flour and baking powder into the yolk mixture. Mix until well combined. 4. Whisk the egg whites and cream of tartar to stiff peaks. 5. Gradually fold in the egg whites into the yolk and flour mixture. 6. Pour the batter into the prepared pans and bake for about 25 mins or until a skewer inserted into the center comes out clean. 7. Leave to cool in the pan for about 15 mins before inverting onto a wire rack to cool completely. 8. Sandwich the cakes using some of the buttercream icing and decorate the exterior with the remainder. 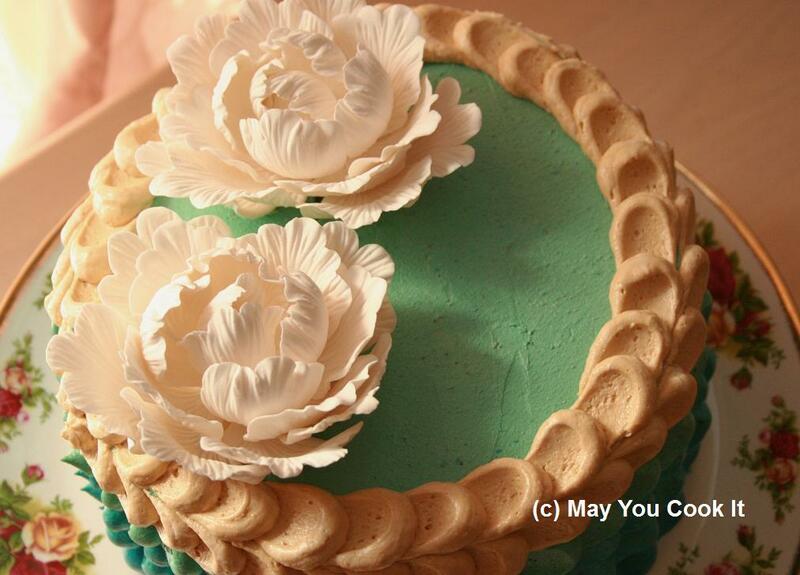 I used a blue ombre design for my brother’s cake and topped it off with 2 large gumpaste flowers. 1. Whisk butter and icing sugar until light and creamy. 2. Add the essence and a little milk if a lighter consistency is desired. This entry was posted in Cakes, Desserts, Muffins & Cookies on May 11, 2013 by m.
This chocolate mousse is very simple to make and delicious too. It’s a great choice when you want to make dessert in advance but don’t want to spend a lot of time preparing it. 1. Place the biscuits in a food processor and grind to a fine consistency. Or place the biscuits inside a ziplock bag and crush with a rolling pin until crumbly. 2. Mix in the melted butter and almond meal with the ground biscuits then press the mixture into a greased tart pan. 3. Bake at 180 for about 15-20 minutes until golden. Remove from the oven and cool completely. 4. Mix the gelatine into the warm water. 5. Melt the chocolate in the microwave or a double boiler until smooth. 6. Whisk the cream, then gently pour in the chocolate and gelatine into the cream. Continue whisking until smooth. 7. Pour the mixture into the cooled base then place in the fridge to set for 1-2 hours. 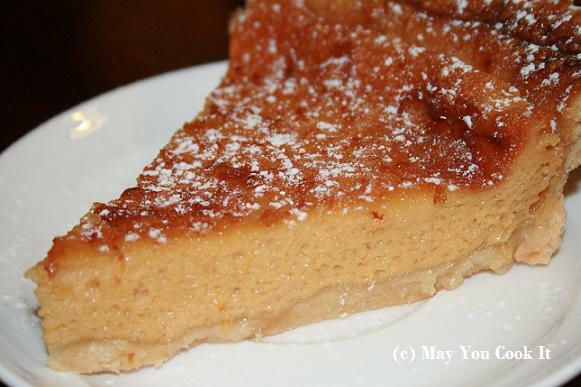 This entry was posted in Desserts on March 3, 2013 by m.
Egg pies are one of those kinds of dishes that take me back to my childhood. I used to love eating egg pies, especially when they were cool, straight out of the fridge. I never could figure out why I grew out of them, but for some reason, I haven’t really hankered after them over the last few years. That changed last night when I suddenly had a craving for a slice of cool, soft, creamy egg pie. That the craving would come in the evening when all bakeries are closed is just typical of my cravings which always seem intent to achieve maximum inconvenience for me. There was nothing for it but to head to the kitchen and whip up a batch. It was delicious though and I think I will stock up on some ready-made pastry shells or short crust pastry for next time. The recipe is pretty simple but making the pastry from scratch can take some time. Blend flour and salt in a bowl. Cut in the shortening using a pastry cutter. Combine the vinegar, water and egg yolk. Gradually add it to the flour mixture and knead the dough well. Leave the dough to rest about 30 mins. Roll out the dough to fit into a 16 inch pie plate with about 2 inches extra for the sides. Press the dough into the pie plate and allow the sides to hang over the pie plate. Press out the crust around the sides and cut off any excess dough. Whip the eggs then mix in the remaining ingredients. Bake for 15 minutes then reduce the heat to 180 degrees celsius. Bake for another 15-20 minutes until cooked (you can test it by inserting a toothpick in the custard- if it comes out clean, the pie is ready). 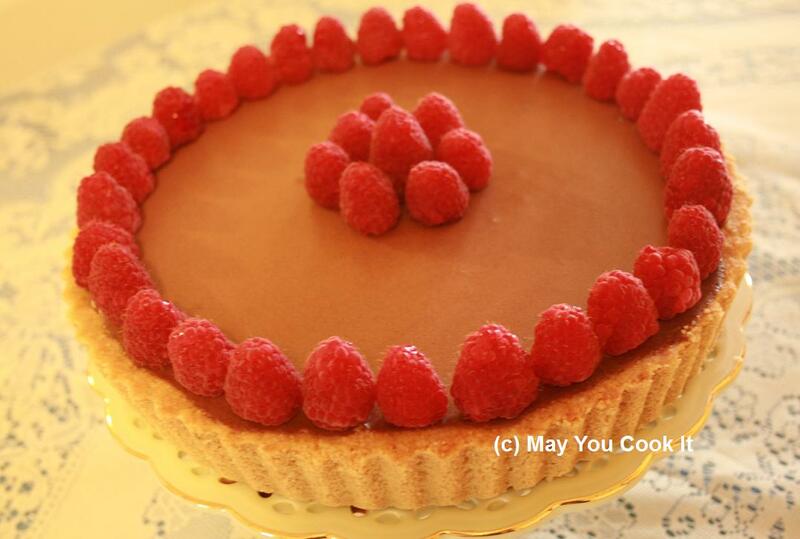 This entry was posted in Desserts and tagged Egg Pie, Pie on February 3, 2013 by m.